My name is Melissa Hruby and I am currently a sophomore majoring in animal science at the University of Wisconsin-Madison. This week concludes a four-week internship at the Florida State University Coastal and Marine Laboratory (FSUCML). I was drawn to FSUCML by the interesting research being conducted on coastal fishes including reef fish and sharks. I am still at the beginning stages of deciding on which science career path to take and thought this internship would be an excellent opportunity to gain hands-on experience in marine research. Indeed, this internship has exceeded my expectations and has exposed me to a field of research I never before knew existed. The main focus of my internship was to work with Chris Malinowski on his Goliath Grouper dissertation research. Throughout the duration of my visit, I was able to partake in two sampling trips—each in a different region of Florida. The first was a one-day trip off of the lab in the Gulf of Mexico, and the second a six day trip out of Jupiter, FL in the Atlantic Ocean. Working with Chris through the process of trip planning and preparation, the actual fieldwork, and post-trip sample processing and analyses, gave me a glimpse of many aspects comprising Chris’s research. These trips were both instructive and personally rewarding. I learned a lot about the biology of this native species, which was once almost fished to extinction, and of the techniques and mechanics involved in collecting data. Above all else, I got to experience the thrill of pulling in one of the largest bony fish in the world. Although we caught many Goliath Grouper over the course of these trips, I managed to pull in the largest one, which measured 216 cm in length (estimated > 500lbs)! This was by far my favorite part, and is something I will never forget. I was also fortunate enough to tag along on a shark survey excursion near the end of my internship. I assisted Cheston Peterson and a few others in a coastal shark survey. I quickly learned how much work it takes to sample a single shark, and developed an admiration for Cheston’s persistence and passion for these creatures. 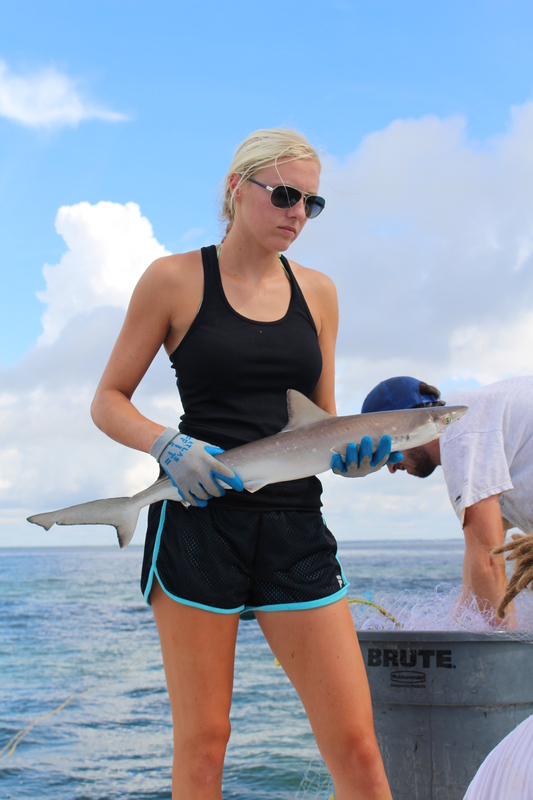 From just one day in the field with Cheston, we sampled over 80 sharks from five different species. 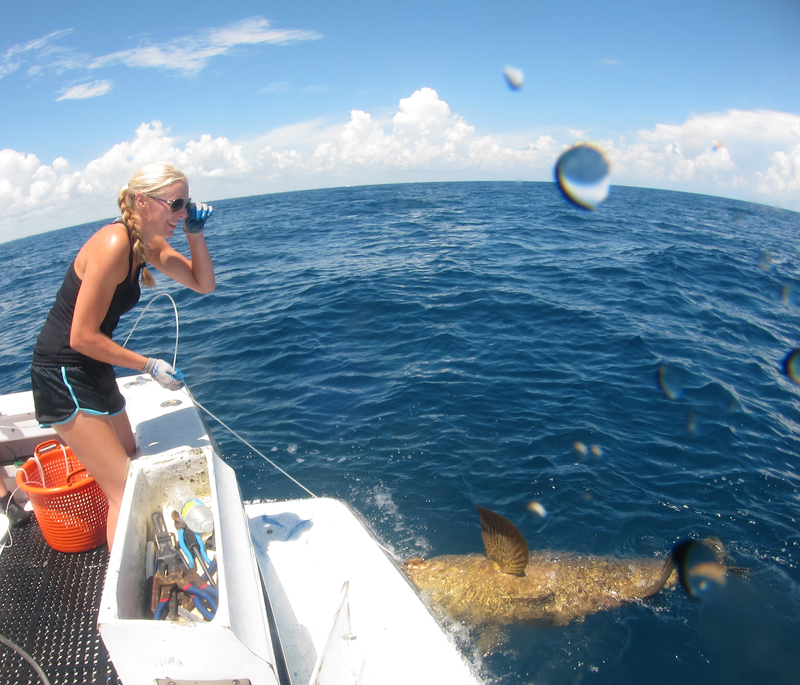 My favorite part of this trip was hauling the large sharks (> 7 ft) on deck. This gave me a chance to work with these beautiful and admirable animals up close and to view them in a light that many people don’t get the chance to. Participating in this internship has been especially beneficial to me in my search for a career path and as I explore life interests. There are scarce opportunities, if any, involving this type of research in Wisconsin, so I was extremely fortunate in getting the chance to help Chris and other students from FSUCML with their research projects. Although I may not make a career of catching 500lb Goliath Grouper or seven-foot sharks, I will definitely put my newly acquired knowledge and skills to use in the future. After working in the field, I have learned how important effective teamwork is for the success of large collaborative research projects. Getting vital and timely data from each and every fish would be nearly impossible without cooperative efforts form everyone aboard the boat. From the organizational complexity of the project to the art of catching these giant fish, the entire process is far from easy and the teamwork behind it is what makes it successful. I plan on using the knowledge and insights I’ve gained through this internship to further advance my learning and to educate others whenever I can.